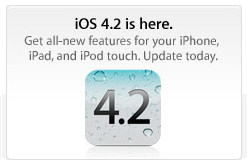 Well this isn’t big surprise for us, as iOS 4.2 should have been released by now. The wifi bug which resulted in delay of iOS 4.2, the fix for wifi bug of iOS 4.2 was seeded as iOS 4.2.1. Now here is official press release statement from Apple that iOS 4.2 will be releasing today for all idevices. iOS 4.2 for iPhone & iPod Touch may not come with many new features but iPad users are going to be benefited most. Below is complete press release statement from Apple. “CUPERTINO, California—November 22, 2010—Apple® today announced that iOS 4.2, the latest version of the world’s most advanced mobile operating system, is available today for download for iPad™, iPhone® and iPod touch®. iOS 4.2 brings over 100 new features from iOS 4.0, 4.1 and 4.2 to iPad including Multitasking, Folders, Unified Inbox, Game Center, AirPlay® and AirPrint. The Find My iPhone (or iPad or iPod touch) feature is now free to use without a MobileMe? subscription and helps you locate your missing device. * The Find My iPhone app is a free download on the App Store? and lets users easily locate a missing device on a map and have it display a message or play a sound. Users can even remotely lock or wipe data from a lost device to protect privacy. Stay tuned with us for the direct download links of iOS 4.2 for iPhone, iPod Touch & iPad.